Dr. Mark Ngo is proud to serve the needs of patients from the South Puget Sound community of Puyallup, WA. Our dental team is dedicated to helping patients achieve long-lasting oral health through conservative and comprehensive dental care. From protecting young smiles from cavities with sealants to helping adults complete their smiles with dental implants, Dr. Ngo offers individualized care for patients of all ages. Our South Hill Puyallup dental practice is a leader in providing innovative, quality care. As a technology-centric practice, we frequently incorporate innovative tools and techniques into our procedures, providing patients with the latest in modern dentistry. At Mark T. Ngo, DMD, PS, every consultation includes an in-depth look at the procedure and recovery process for patient education. Our mission is to help patients understand their dental needs, which procedure will help them address their oral issues, and what expected results can be. When combined with the innovative technology offered at our practice, patients can feel confident knowing that they are receiving the best dental care possible. Dental care at our Puyallup dental office doesn’t end immediately following your procedure. Our dental team helps patients understand the importance of good oral health through preventive health coaching, ensuring that patients have the skills and knowledge needed to practice good oral hygiene on their own. In doing so, patients can enjoy lasting oral health and beautiful smiles well after their procedure. 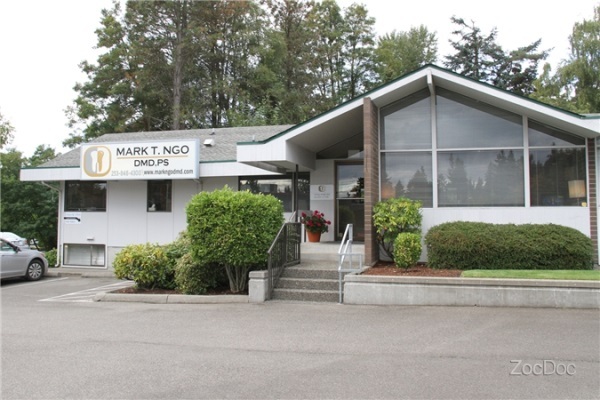 The dental team at Mark T. Ngo, DMD, PS is proud to serve patients from Puyallup and the surrounding Pierce County communities of Tacoma, Edgewood, Graham, and Sumner. We are conveniently located at the intersection of 39th Ave and 94th Ave, across from Costco. Contact our dental office today to schedule your next dental appointment.